Oh, and the magnetic North pole is moving East towards Asia. The Earth’s magnetic field is an essential part of the planet. It protects us from the harsh conditions of the universe and allows life as we know it to thrive. And it’s been changing drastically, weakening over some parts and strengthening over others. In a quest to understand more, two years ago, the European Space Agency (ESA) created Swarm—a mission solely dedicated to observing and understanding the Earth’s magnetic field, and any changes happening to it. Observations now prove that the Earth’s magnetic field is weakening 10 times faster than we thought. One of the reasons proposed is that, perhaps, our magnetic field is “flipping,” a normal phenomenon believed to occur every 100,000 years or so. And after years of gathering data, Swarm’s three satellites were able to map the changes in strength to the Earth’s magnetic field in detail. “Swarm data are now enabling us to map detailed changes in Earth’s magnetic field, not just at Earth’s surface but also down at the edge of its source region in the core,” says Chris Finlay of DTU Space in Denmark, who leads the ESA project. 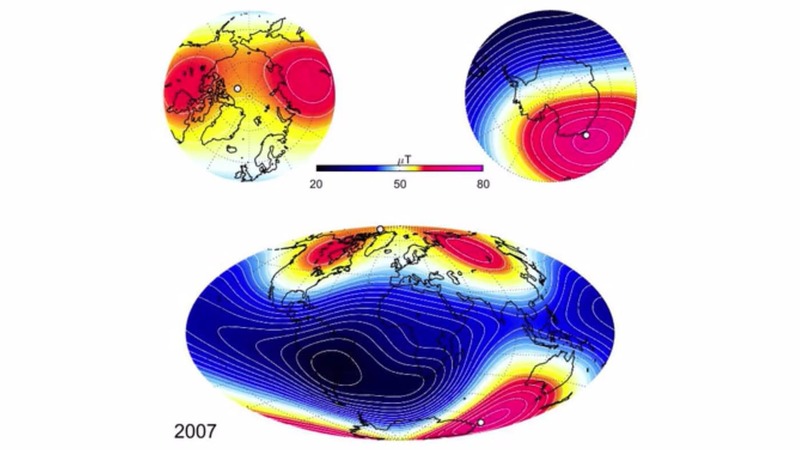 Oh, and the magnetic North pole is moving East towards Asia, too.